Concluding our mini-series on sharing economy platform businesses, today we will apply a very wide lens on the potential impacts and opportunities of our innovations. Last time, we talked about positive and negative impacts and how we as innovator can take part in finding solutions rather than awaiting potentially heavy-handed regulations. Join me to see the arguments on both sides! One widely-known researcher of the social aspects of the sharing economy is professor Juliet Schor. I am going to cite from two of her works. One of them talks more broadly about sharing platforms, the other paper focuses on for-profit platforms. The latter account is far more critical. As innovators we need to face criticism even if it means taking a few jabs on the chin just to participate in finding innovative solutions to justified criticism. That certainly seems to be the way the new Uber CEO seems to be managing things. A new utopia or just business-as-usual? “Platforms such as Airbnb and Uber are experiencing explosive growth, which, in turn, has led to regulatory and political battles. Boosters claim the new technologies will yield utopian outcomes—empowerment of ordinary people, efficiency, and even lower carbon footprints. Critics denounce them for being about economic self-interest rather than sharing, and for being predatory and exploitative. Not surprisingly, the reality is more complex. While the for-profit companies may be “acting badly,” these new technologies of peer-to-peer economic activity are potentially powerful tools for building a social movement centered on genuine practices of sharing and cooperation in the production and consumption of goods and services. But achieving that potential will require democratizing the ownership and governance of the platforms. A new household model – an opportunity? “[…] a new household model in which people would have diverse sources of income, and would access goods and services through varied low-cost channels. These innovations can provide people with low-cost access to goods and space, and some offer opportunities to earn money, often to supplement regular income streams. The introduction of venture capitalists into the space has changed the dynamics of these initiatives, particularly by promoting more rapid expansion. “Benkler defines “social sharing” as something that takes place among large numbers of weakly connected people. They are participating in a collective practice and typically have multiple motives, including common good outcomes. Although there are multiple motivations for participants in the for‐profit platforms, including some of the common good claims, after the earliest days, studies of users in a variety of countries have found that the dominant incentive has been financial (Balck & Cracau, 2015; Möhlmann, 2015; Schor, 2015a; Stene & Holte, 2015). For consumers, prices are low, for multiple reasons. Some economists believe platforms reduce the previously considerable transactions costs in person‐to‐person economies and mitigate the risks associated with stranger exchange through their ratings and reputational systems, rather than costly branding (Horton & Zeckhauser, 2016; Sundararajan, 2016). Others have pointed to the minimization of labor costs (Hill, 2015; Scholz, 2016) or the ability to evade regulations (Baker, 2014). The authors view the large for-profit platforms critically due to the power they are exercising over the labour/worker relations. Their views on the social impacts are more pessimistic than in earlier years. “The platforms raise the issue of the restructuring of labor relations in a neoliberal era, particularly in terms of rising precarity and the risk shift from firms to workers […] Having interviewed providers over the period 2013–2017, we do see a trajectory of intensified competition, more platform control over workers, and lower earnings on some platforms, especially at the lower wage end of the market. However, we find there is still considerable variation in how laborers feel about their earnings, conditions of work, and overall experiences (Schor et al., 2017). Our findings suggest that the question of whether platforms are empowering or immiserating workers depends to a significant effect on the specific platform being examined, as well as its temporal trajectory. Platforms not only change policies and procedures but also confront an evolving institutional ecology. Furthermore, platform workers are differentially positioned in terms of the assets they bring to the work and their dependency on these income streams. These dimensions are important for understanding why some workers praise platform work, whereas others are extremely critical of it. The authors see a correlation with the type of participation on the platform. They see state that those who generate incremental income on top of their full-time employment are in general satisfied. Those who are fully dependant on the platform work, they state, much less so. We find that satisfaction with platform work is associated with the extent to which workers are dependent on their platform earnings to pay their basic expenses. Dependency affects the extent to which platform workers can exercise some control over when and where they work, which jobs they choose, and their general degree of satisfaction. Worker entitlements are an issue that definitely requires platforms to cooperate in identifying solutions which they have started doing (as reported last time). “Even more than wages, the classification of platform workers has been a point of controversy. Nearly all platforms designate workers as independent contractors, who lack benefits and the rights and protections guaranteed to standard employees. The authors are clear that the sharing economy is part of larger shifts in labour markets. And the last big question is whether or not the big for-profit sharing platforms contribute to widening inequality. “[…] The platforms also raise the issue of class inequality of various types, including their role in fostering a new “servant” economy. By making cheap labor available at the click of a finger, these platforms and apps are leading to a world in which lower income people are deployed to perform everyday tasks for the more fortunate, whether it is delivering a latte in a rainstorm or picking up groceries. One key assumption here is that the biggest players become monopolies that will consequently dictate conditions. But there are other opinions on this. Firstly, there are already a number of well-capitalised competitors in the ride-hailing industry (Uber, Lyft, Ola, Didi – with Uber being a share holder in the latter). E.g. here in Sydney you will find all four competing for customers as well as drivers. Economic theory would suggest that the competition among the companies will give drivers more power and bring up their wages and conditions to the maximum that customers are willing to pay for. 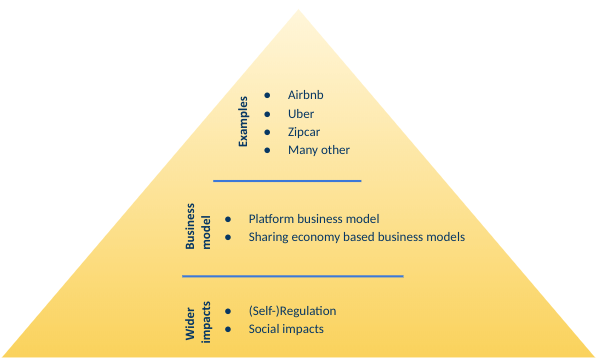 How to harvest the social benefits enabled by sharing economy platforms? 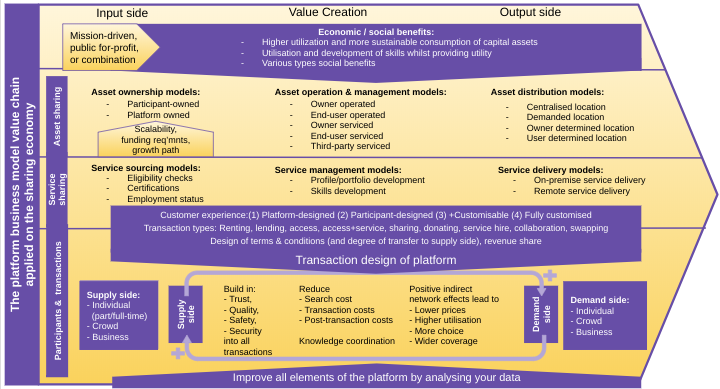 Juliet Schor suggests that the benefits of sharing platform businesses can be harvested in different ways (pdf). “An alternative to the co-optation path is one in which sharing entities become part of a larger movement that seeks to redistribute wealth and foster participation, ecological protection, and social connection. This will only happen via organization, even unionization, of users. An opportunity for below-median income households? This view is not shared by prof Schor “their analysis is problematic because it assumes that low‐income households have valuable assets to rent, which is contradicted by the analyses of Airbnb cited above and to a certain extent by our findings among couriers”. One could counter-argue that renting their car out in the 95% of the time that it is not being used could be a way to make purchase of these assets more affordable by contributing to the repayments. New ways to provide trust and social capital? One of the most fascinating questions in my mind is whether or not platforms contribute to how trust is built within a society and what the long-term effects of this may be. A good source covering this from some practical perspective is professor Sundarajan’s European Union policy proposal (pdf) that I have cited last time. “This re-integration of social ties into commercial exchange leads one to reflect on the fact that the social aspect of commerce has historically played a central role in facilitating trust. Since much of government regulation exists to fill gaps in commercial trust, and trust is the foundation of any economy, any discussion of regulation requires further exploration of this connection as a preamble. […] Put differently, trust relies on verifying identity ( Is this provider real? ), intentions (Do these providers have good intentions) and capabilities (Is this person a good freelancer/driver/etc? / is it a good go) . “Because the collaborative economy creates new ways of providing familiar services that are traditionally often highly regulated, regulatory conflict is to be expected, and indeed, around the world, governments have struggled with how to best regulate this new form of exchange. This historical parallel is provided to underscore the fact that today’s shift to the platform-mediated collaborative economy, with its new social aspects, introduces new trust challenges but also provides new solutions to existing trust challenges. Regulation, often interwoven with the provision of trust, doesn’t always have to originate with governments. Regulation can take on myriad forms, governmental and otherwise. Trust-based reorganisation of economic activity? And I want to conclude with the exciting thought that the sharing economy innovation may – in this optimistic scenario – lead to reorganising economic activity around trust-based interactions. If you are interested in this type of discussion, check out my last article with a listing of positive and negative effects, possible options and further in-depth resources. Everybody is entitled to their own conclusions, extrapolations and views. It was my aim to provide view points from critical as well as supportive sources. I hope I have found a good balance. My appeal to any innovator is to try keep an eye on the wider aspects of our ideas and innovations. It takes a wide lens to develop innovation ideas you can be proud of!